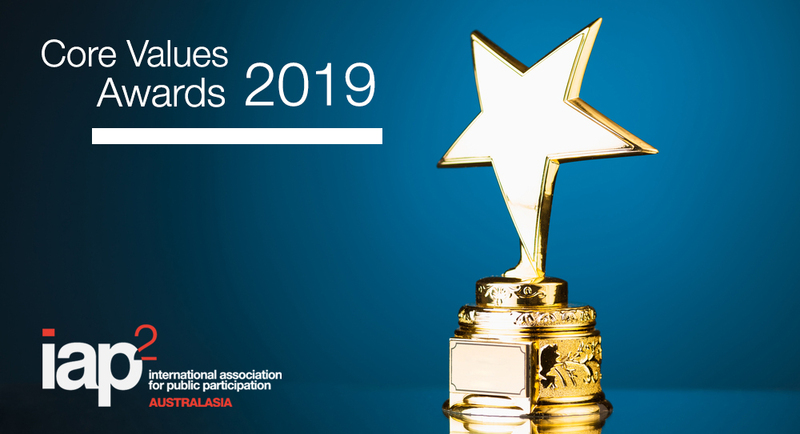 IAP2 Australasia is excited to announce the flagship awards program, the 2019 IAP2 Core Values Awards, is now open for entry. IAP2 Australasia’s Core Values Awards recognise and encourage projects and organisations that are at the forefront of public participation. The Awards were created to encourage excellence, quality and innovation in public participation. Embedding the IAP2 Core Values in organisations and projects that demonstrate leading practice is a key focus for the Awards. In 2018, IAP2 Australasia saw some outstanding projects at the forefront of community and stakeholder engagement in Australasia. (Discover more about the winners by downloading the 2018 Core Values Showcase here and the 2018 IAP2A finalists case studies here. Will 2019 be your year in the spotlight? Application for the 2019 Core Value Awards are now open until 26 April 2019.